This was a concept I toyed with - but have been beaten too. 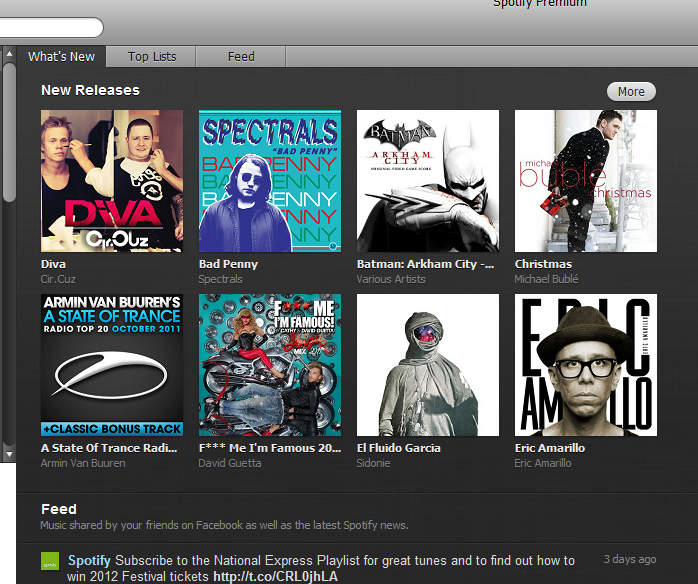 Some savvy marketer has worked with Spotify's licensing team (seperate from their advertising team) to get the musical score to the computer game Batman: Arkham City on the What's New recommendations page. You can checkout the playlist with this Spotify playlist. Is it any good? Well. I've listened to movie scores while I've worked before - can be useful to conjure up the right mood. In every case I'd seen the movie before and I just don't have the time to risk a Batman: Arkham City addiction so I've not yet played the game. Tried to listen through this score but gave up. However, as this the Halloween season I suspect more than a few people will clue up and use this recommendation to play music for a party this weekend.